We’re incredibly proud of our heritage. As we continue to celebrate our 140th year in business, we have been reflecting on how far we, and the world we live in, has come since we were founded in 1876.  The spirit of enterprise, integrity and innovation which characterises Musgrave is what makes us unique. Through economic downturns and significant world events, our policy of investing, changing and innovating has been key to our success.  It is as we reflect on our past that we realise how much our values and people have made Musgrave what it is today; strong, resilient and ready to continue in the spirit of our innovative founders who had a progressive and dynamic approach to business. 1876Like many things, it started with a brew. The Musgrave brothers, Thomas & Stuart opened a grocery store in Cork City. They started selling tea, but what’s tea without a biscuit? They decided to start stocking food too. 1894Time to get official. The company became ‘Musgrave Brothers Ltd’, with a charter to retail and wholesale. 1908The next generation. Thomas’ son, John L Musgrave became Managing Director. He must have loved his job as he was head of the company for four decades. Hats off to you John! 1925On the move. We had outgrown our Grand Parade premises and decided it was time to relocate to our purpose built Cornmarket Street HQ. 1950All aboard the VG Trading System. It was time to join the system increasing our buying power and lowering our distribution costs – a win-win. 1961By the middle of 1961 Musgrave had over 140 retailers signed up for their innovative group trading model, the first in Ireland, and had launched the revolutionary self-service concept. 1972Look at us go. Musgrave opened Dublin's first cash-and-carry and we named it Robinhood. Early 1980’s1 became 2. Family member, Hugh MacKeown updated the VG system and divided it into two branded stores. The big stores were named SuperValu and our small convenience stores named Centra. Ring any bells? Late 1980’s There’s just no stopping us. Our SuperValu stores were already at 122 and our Centra stores 250! 1994We took a holiday. The acquisition of the Spanish Dialsur businesss was now complete, and the once little family business had now become an international family business. 2002-2004Hello Britain! We acquired the British brands Budgens and Londis, growing the business even further. 2011Forever growing. Musgrave bought 24 Superquinn stores and converted them into SuperValu stores, so we could gain more presence in Dublin. 2015Not so long ago now. We broke our ties with the Great Britain brands and refocussed on Ireland and Spain transitioning the business into a steady profit and on to a growth trajectory, always moving forward. 2016140 years of looking forward. We look forward as the leading Irish-owned family business, with pride in our history and confidence in our future. Progression, taking risks, winning some, losing some, but never giving up on new challenges has made Musgrave a success…and we’re still drinking tea. From our original small grocery store owned by two brothers, we’re now Ireland’s largest private employer with over 35,000 employees. Our family business is sustaining long term stable relationships, built on a bedrock of honesty, working hard, achievement and not being greedy. Our values stand us in good stead in the modern world. As we continue to adapt, innovate and move forward into the future, these principles will be at the heart of every decision we make. The Musgrave logo is inspired by the elegant script of the Chairman’s signature in 1902 and represents our heritage as as sixth generation family run business. In this short video, find out more about what the logo means to us. We’re grateful to each and every one of our colleagues who have played their part in making Musgrave what it is today. 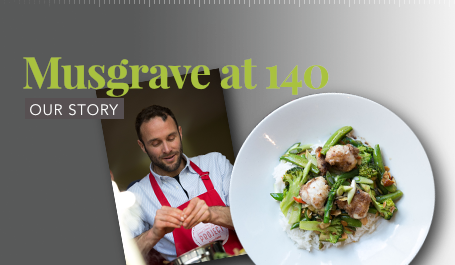 As part of reflecting on our 140 year history we invited colleagues past and present to share their special memories of working with Musgrave. What they had to say gave us a special insight into our own history, and brought back delightful memories for many. Mary Crowley shared her memories of her 20 years working at Musgrave working with Musgrave in Cork. People like Mary have all played their part in making Musgrave what it is today and we’re grateful to her and all of our colleagues throughout our long 140-year history. Mary presented us with her favourite photograph of her and her friends at our headquarters in Cornmarket Street in 1963. We have spoken with many of our past colleagues who have shared their ‘memories’ from their time working at Musgrave, giving us an insight into our own history. Larry Costello shared his memories of his two decades working in Musgrave. Thank you Larry Costello for your work, loyalty and for sharing your special memory of your time in Musgrave. Our former colleague, Tom Ryan recently recalled the best moments of his 35 year with Musgrave. Tom has been a tremendous asset to Musgrave and we’re grateful for his commitment. We were touched to hear the story from our former colleague Paul Byrne who told us how Musgrave once delivered a hamper to his relative when she was a little girl in the 1920’s. We believe it was a very special gift from ‘Santa Claus’ that year and we’re touched that our gesture is among her most cherished memories. We’re delighted to send Paul’s relative another hamper of treats and hope she enjoys them just as much as she did back then. As part of our 140th anniversary, we went on a quest to celebrate our people. We invited our colleagues to tell us about their peers – those who inspire and show true passion and dedication in bringing to life our values. We were incredibly touched by the hundreds of heartwarming and honest stories of praise of colleagues, importantly, by colleagues. Here’s a snapshot of the people who make Musgrave what it is today. We’re proud of each and every one of you.